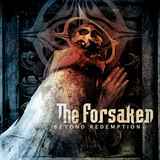 For those unfamiliar, The Forsaken are one of the Swedish melodic death/thrash groups stuck between proverbial A and B tiers at the time when they were the most active, at the beginning of the previous decade, when they released three quick albums on Century Media. All three of those albums could not vault The Forsaken to the top of the heap where Dark Tranquillity and In Flames (formerly) reigned supreme, but all of those albums left a more brutal mark after they were through, veering closer to the sound of Hypocrisy and Dimension Zero. Whether Beyond Redemption is an attempt for a comeback or The Forsaken waited for a lot of competition to die out in the overpopulated genre, but Beyond Redemption is very much a reminder of where The Forsaken was coming from earlier, with a little bit more focused songwriting. The more things evolve the more they stay the same, the tiger can't bleach out his stripes - insert your own figure of speech here. The Forsaken continue pushing their brand of bipolarity combining bouncy At the Gates tributes and slower, groovier songs with an obvious deeply pessimistic outlook. Opening title track, As We Burn and Force Fed Repentance can't help but bring Slaughter of the Soul to mind with their infectious shreds of melody, enlivening and sometimes expansive (As We Burn) leads. Those leads can even veer into cleaner territory (Reap As We Have Sown), adding another dimension to the music. Most of the time, however, The Forsaken rely on their surly and burly wall of guitars, vocals by Anders Sjoholm not interested in exploring much more than the bottom of the trough growls (Foul Messianic Grace). Even those moments which are more melodic on those deathlier tracks, they bring the melodies of Armageddon, of something bound not to end well (Only Hell Remains). Throughout it all, slow or fast, drummer Nicke Grabowski provides a thundering background, a constant forceful undertow sucking everything else in. Not a real breakthrough, and definitely not a departure from their earlier works, Beyond Redemption would not vault The Forsaken through the ceiling they were unable to crack the first time around, but it certainly provides an outlet when you need to bash it all in.